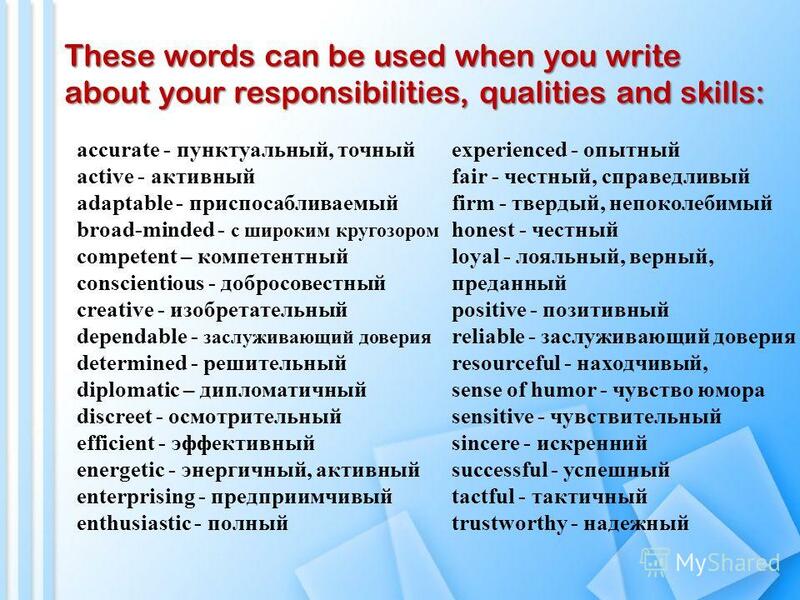 Презентация на тему: "How to Write a CV. 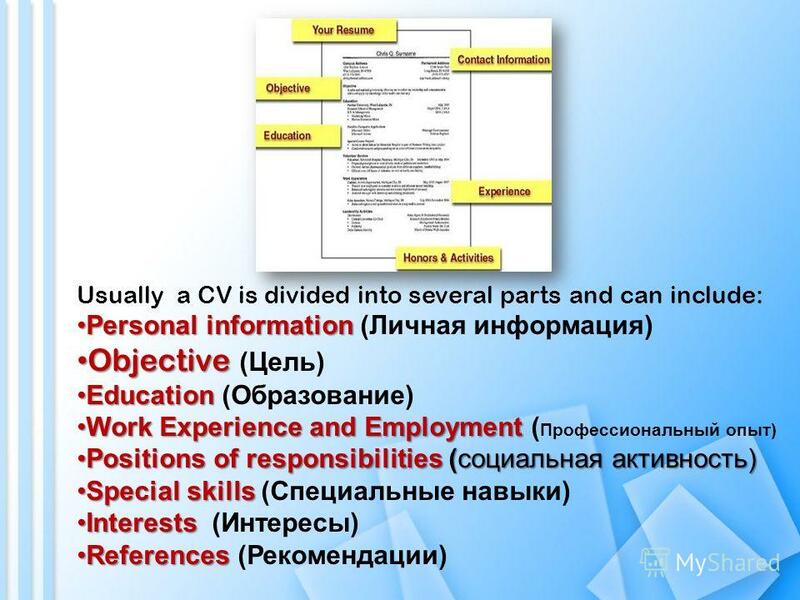 Usually a CV is divided into several parts and can include: Personal informationPersonal information (Личная информация) Objective.". Скачать бесплатно и без регистрации. 4 Objective This is statement of what you actually want to do. If you apply for a job, you can write " to obtain a position in..., where I can use my skills in…". You should show what you can do for the company more than what the company can do for you. Obtain employment in the field of public relations that will allow me to use my ability to work with people and take advantage of my knowledge of English. 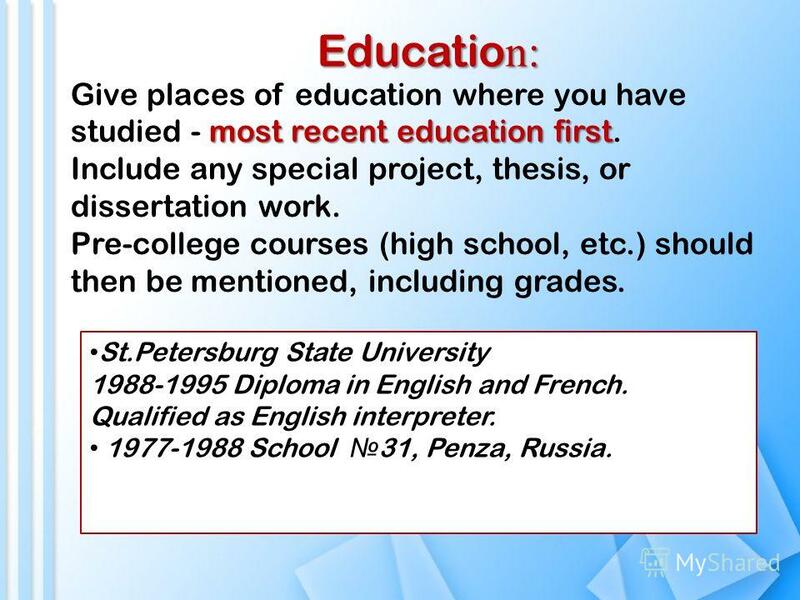 5 Educatio n: most recent education first Give places of education where you have studied - most recent education first. Include any special project, thesis, or dissertation work. Pre-college courses (high school, etc.) should then be mentioned, including grades. St.Petersburg State University Diploma in English and French. Qualified as English interpreter School 31, Penza, Russia. 6 Working Experience Include all your work experience in reverse chronological order. Include the following for every description: - Title of the position - Name of the organization - Location of work - Date of employment Stress your best and most relevant achievements. 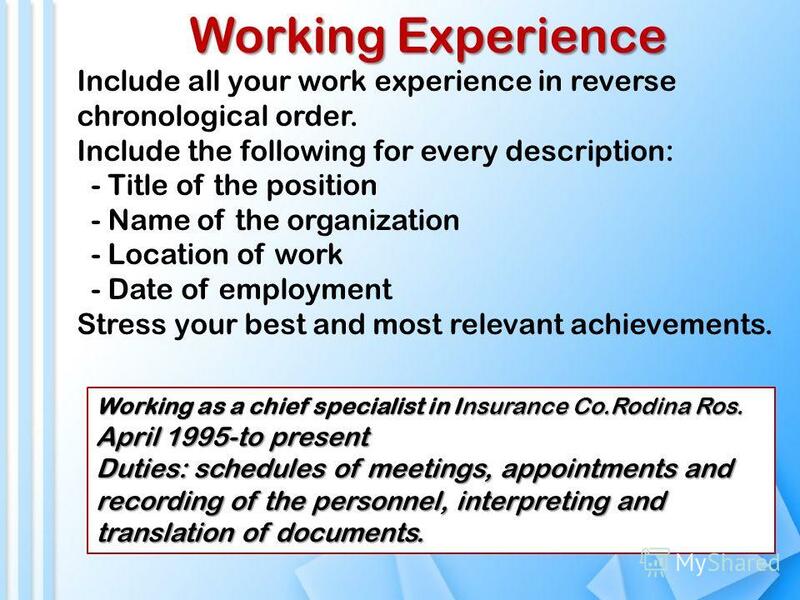 Working as a chief specialist in Insurance Co.Rodina Ros. April 1995-to present Duties: schedules of meetings, appointments and recording of the personnel, interpreting and translation of documents. 8 Position of Responsibility List all awards and honors you have achieved in reverse chronological order. Include achievements from all areas of your life – academic, sporting, within the community, etc. Publications, Conferences, Presentations: They can provide a significant point of difference between you and other candidates for positions where such skills are both valued and relevant. 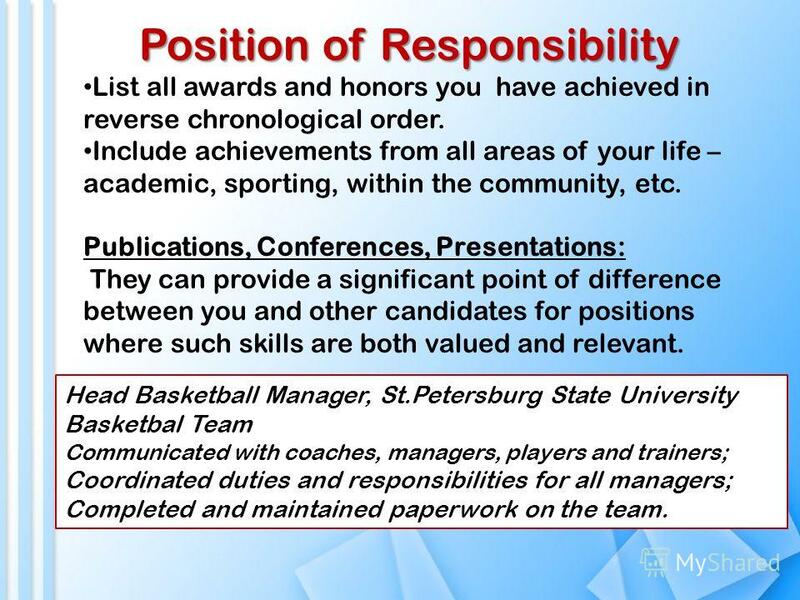 Head Basketball Manager, St.Petersburg State University Basketbal Team Communicated with coaches, managers, players and trainers; Coordinated duties and responsibilities for all managers; Completed and maintained paperwork on the team. 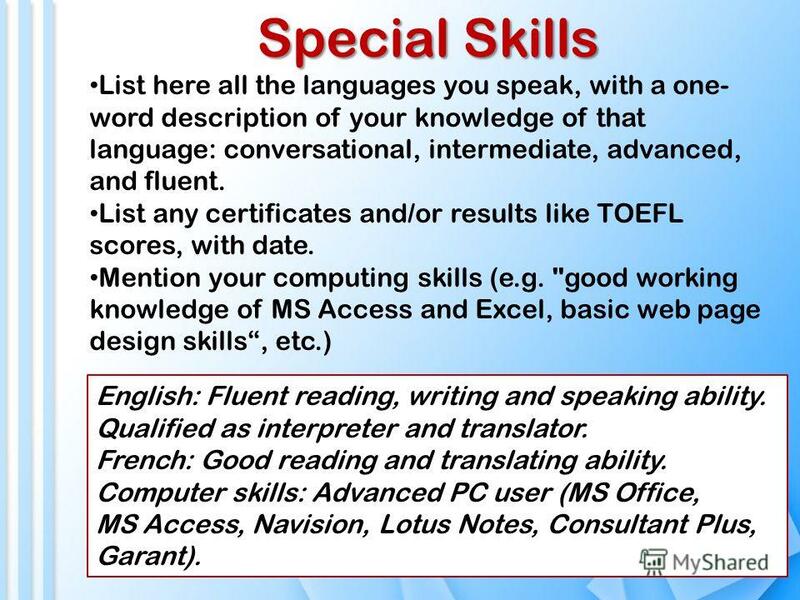 9 Special Skills List here all the languages you speak, with a one- word description of your knowledge of that language: conversational, intermediate, advanced, and fluent. 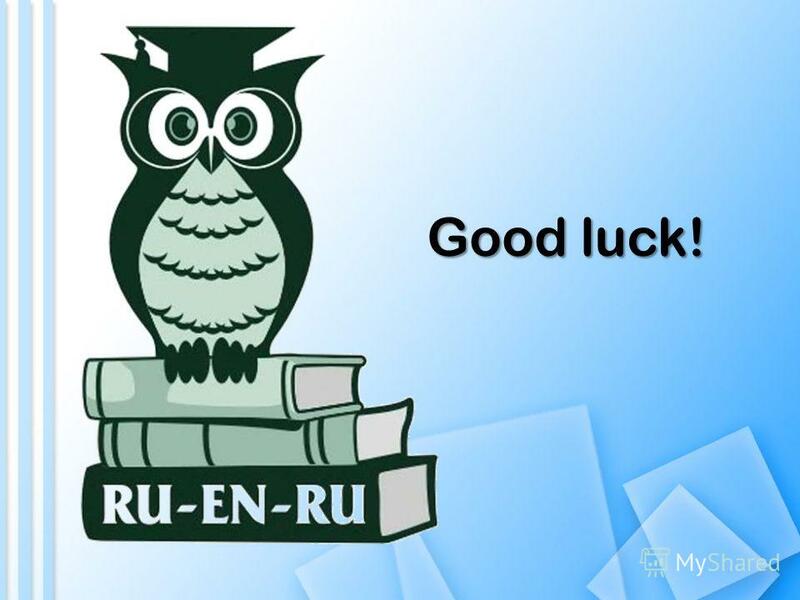 List any certificates and/or results like TOEFL scores, with date. Mention your computing skills (e.g. "good working knowledge of MS Access and Excel, basic web page design skills, etc.) 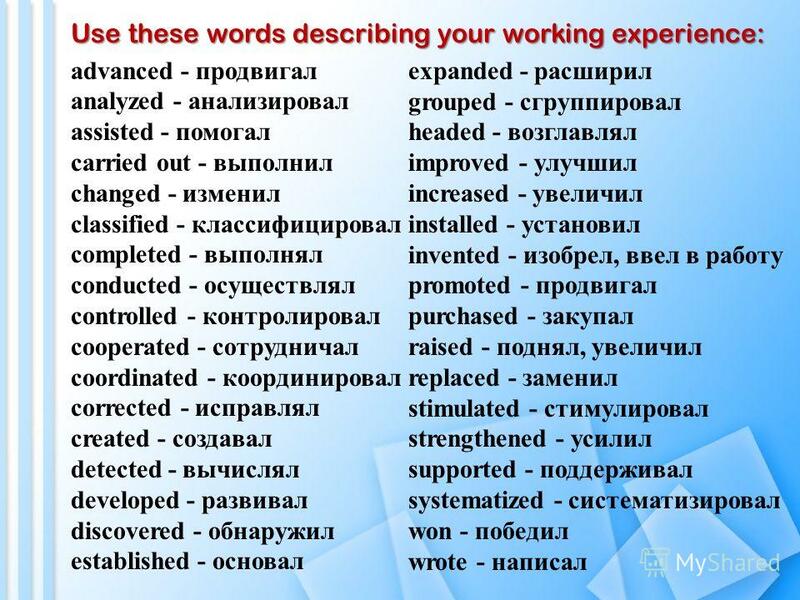 English: Fluent reading, writing and speaking ability. Qualified as interpreter and translator. French: Good reading and translating ability. 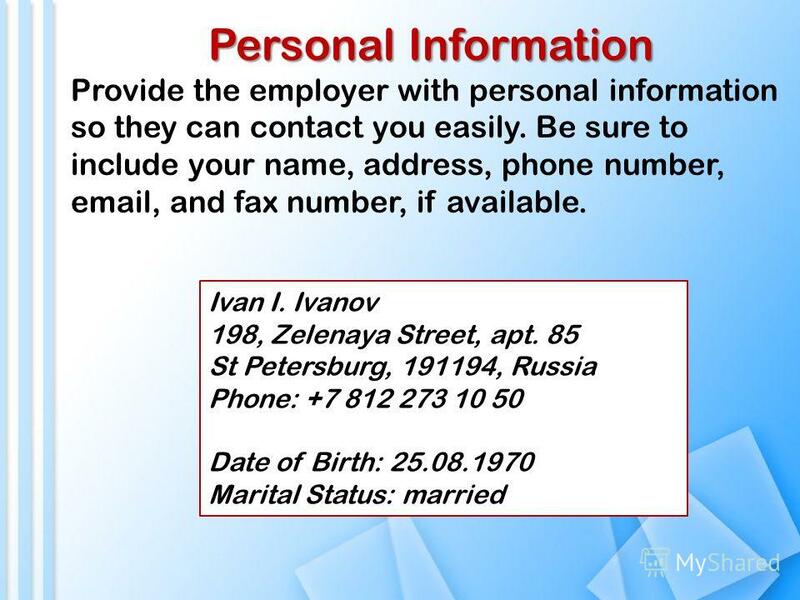 Computer skills: Advanced PC user (MS Office, MS Access, Navision, Lotus Notes, Consultant Plus, Garant). 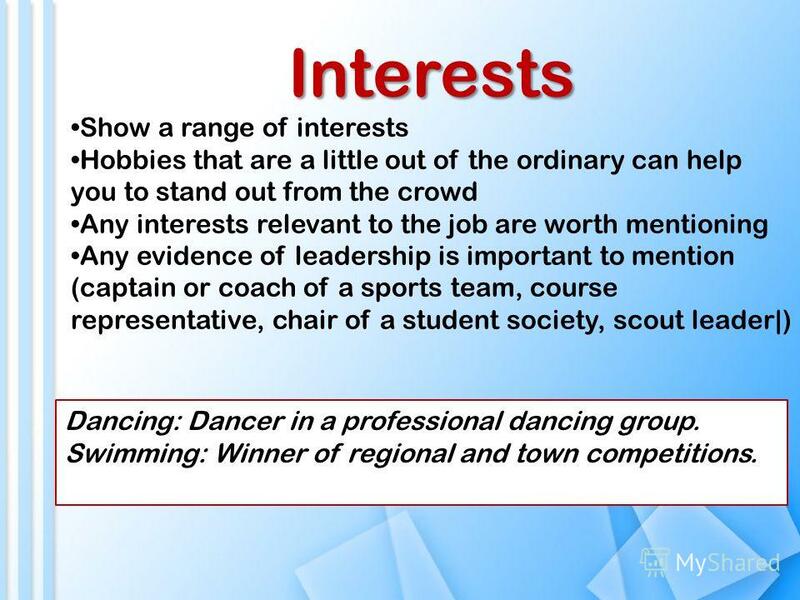 10 Interests Show a range of interests Hobbies that are a little out of the ordinary can help you to stand out from the crowd Any interests relevant to the job are worth mentioning Any evidence of leadership is important to mention (captain or coach of a sports team, course representative, chair of a student society, scout leader|) Dancing: Dancer in a professional dancing group. Swimming: Winner of regional and town competitions. 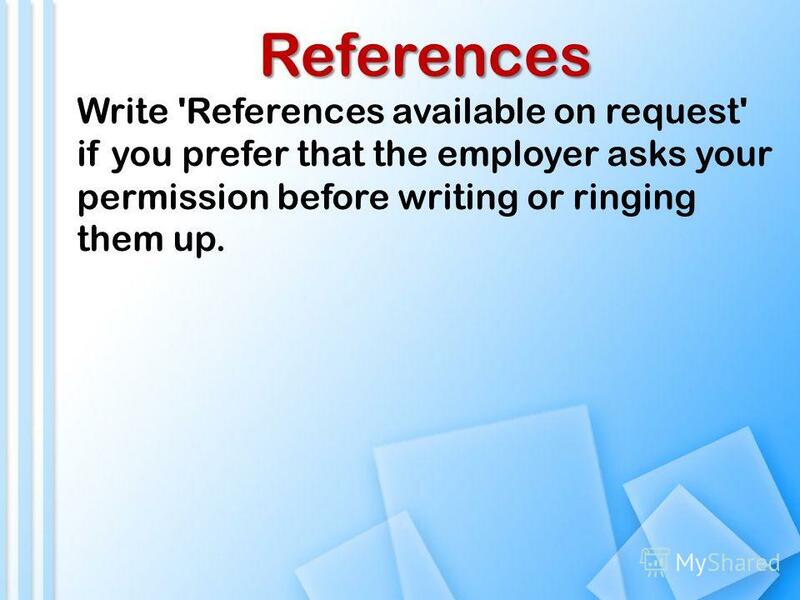 12 References Write 'References available on request' if you prefer that the employer asks your permission before writing or ringing them up. A FORMAL LETTER OF APPLICATION. 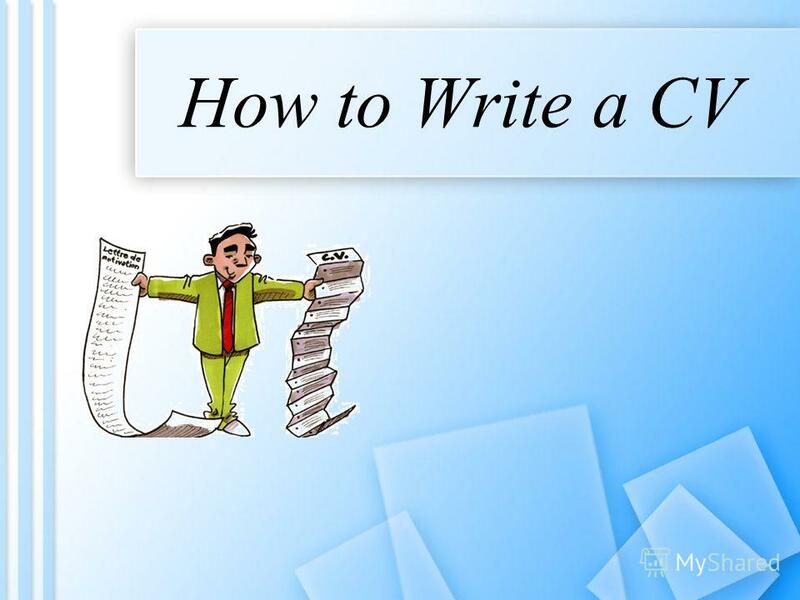 PARAGRAPH 1 REASONS FOR WRITING Simply state your reasons for writing: - Im writing to you with reference to… - Im writing. Moscow 2011-2012 Project work. Aims 1.To prove that in the schools of the future dozens of various devices will be used in every classroom. 2. To carry. ЕГЭ 2014 Письмо (an opinion essay)С 2 МБОУ СОШ 1 г. Александров Владимирская область учитель английского языка Г.А.Семенова 2013 г. Choosing a career and getting a job are two things any person passes through in his life. There are many professions and it is not an easy task to make. How to crack technical interview ? Yogesh Mehla. Many of my friends who are technically good and even great, but they are unable to crack their first. Management styles. 1. What makes a good leader or manager? NEW Business NEW Business. What is business? A business can be defined as an organization that provides goods and services to others who want or need. LEADERSHIP SKILLS. Many years of experience in Exploring have shown that good leadership is a result of the careful application of 11 skills that any. PERFORMED:student of the 2012 USENBAY G.N. Independent work of students TITLE: ABOUT THE FUTURE OF MY PROFESSION. Purposes Working with students Working with teachers Opinion Conclusion. Teaching Methods C&G 7303 – Preparing to Teach in the Lifelong Learning Sector. Manakova Svitlana 11-A According to research by experts in the field of education the best way to train - it is away from home, from the city, with an.